task spooler is a Unix batch system where the tasks spooled run one after the other. The amount of jobs to run at once can be set at any time. Each user in each system has his own job queue. 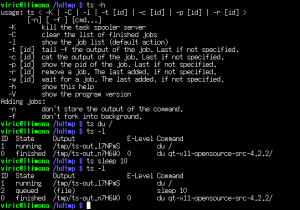 The tasks are run in the correct context (that of enqueue) from any shell/process, and its output/results can be easily watched. It is very useful when you know that your commands depend on a lot of RAM, a lot of disk use, give a lot of output, or for whatever reason it's better not to run them all at the same time, while you want to keep your resources busy for maximum benfit. Its interface allows using it easily in scripts. Queue jobs from different terminals. Use it locally in my machine (not as in network queues). Have a good way of seeing the output of the processes (tail, errorlevels, ...). Easy use: almost no configuration. Easy to use in scripts. It works in most systems I use and some others, like GNU/Linux, Darwin, Cygwin, and FreeBSD. No configuration at all for a simple queue. Good integration with renice, kill, etc. (through `ts -p` and process groups). Have any amount of queues identified by name, writting a simple wrapper script for each (I use ts2, tsio, tsprint, etc). Control how many jobs may run at once in any queue (taking profit of multicores). It never removes the result files, so they can be reached even after we've lost the ts task list. Transparent if used as a subprogram with -nf. Optional separation of stdout and stderr. TS_SOCKET the path to the unix socket used by the ts command. TS_MAILTO where to mail the result (on -m). Local user by default. TS_MAXFINISHED maximum finished jobs in the queue. TS_ONFINISH binary called on job end (passes jobid, error, outfile, command). TS_ENV command called on enqueue. Its output determines the job information. TS_SAVELIST filename which will store the list, if the server dies. TS_SLOTS amount of jobs which can run at once, read on server start. -S [num] set the number of max simultanious jobs of the server. -t [id] tail -f the output of the job. Last run if not specified. -c [id] cat the output of the job. Last run if not specified. -p [id] show the pid of the job. Last run if not specified. -o [id] show the output file. Of last job run, if not specified. -i [id] show job information. Of last job run, if not specified. -s [id] show the job state. Of the last added, if not specified. -r [id] remove a job. The last added, if not specified. -w [id] wait for a job. The last added, if not specified. -u [id] put that job first. The last added, if not specified. -U swap two jobs in the queue. -n don't store the output of the command. -g gzip the stored output (if not -n). -f don't fork into background. -m send the output by e-mail (uses sendmail). -L name this task with a label, to be distinguished on listing. Been using it to manage all sorts of long running tasks for many years, especially video transcoding jobs. Before using ts, I was trying to manage those (poorly) with cron and at.